On the 11th October we hosted a Remembering the Thames Tea Party in the Visitor’s Centre of Mortimer Wheeler House for Silver Sunday 2017. 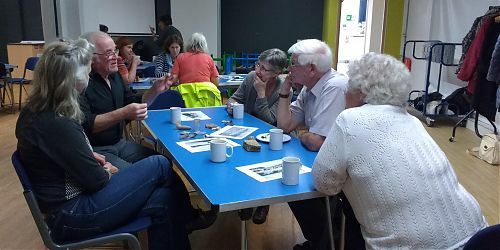 We were joined by twenty older people from Hackney, Islington and further afield, who came along to learn more about the archaeology of the Thames foreshore and share their memories of the river. We had a display of photographs, pictures and books showing the Thames through time and our handling collection of foreshore artefacts to spark conversations, as well as plenty of tea, coffee and cake! Our Oral History Project volunteers talked with attendees and we heard stories of visiting Tower Beach as children, mudlarking in the 70s and 80s, and experiences of working on and beside the river. Thanks for a lovely afternoon at the Remembering the Thames Tea Party. Lively enthusiastic people, lots of interesting “foreshore findings” to get our imagination – and our conversation going. Can’t wait to get more involved! This was the first ever Silver Sunday event in Hackney, and we hope to take part again next year. We had lots of fun, heard some great memories and met several people who we hope to interview as for our London’s Lost Waterway Oral History Project The oral history project aims to record the memories and experiences of the many people who have visited the Thames foreshore for work and leisure. If you have been visiting the foreshore for 20 years or more, we’d love to hear from you! 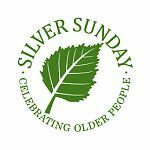 Silver Sunday is an annual day of fun and free activities for older people across the UK on and around the first Sunday in October. Led by The Sir Simon Milton Foundation, it celebrates the value and knowledge they contribute to our communities while combating loneliness and isolation. Everyone can get involved, whether that’s organising an event, spreading the word, or simply attending an activity. We hope to take part again next year, as part of our Older Londoners Project funded by the City Bridge Trust. Thank you to everyone who attended and to our volunteers who helped make the day such a success!